Disclaimer: This pen was provided at discount for review purposes by Goldspot Pens. Pendora’s Box was not otherwise compensated for this review. The opinions expressed are based solely based upon my own experiences with the pen. I think Pelikan came into my consciousness when the company released the Pelikan Souverän M600 Special Edition Pink in 2015. I’m not into “girly things” so pink and lace are not my first choice. Still, there was something appealing about that pen. I didn’t bite but I started to look into Pelikans. I discovered more Pelikan striped pens: tortoiseshell (red, brown, white), and the Streseman. I really wanted a white or tortoiseshell. I made it a goal to get a tortie. Sadly, I discovered them after the most recent production periods ended. I could hope all I want but there was no way to get one except in the second-hand market. I thought I would try to look for one if I ever got out to a pen show. And so, Visconti Homo Sapiens went on the wish list as something more tenable and I didn’t give much more thought to Pelikans for while. Then recently I noticed a few Pelikan M400 brown tortoises popping up in my Instagram feed. At first, I didn’t think anything of them assuming they were yesteryears’ pens. More brown tortoises popped up. I investigated and realized that Pelikan is doing a new release of the brown tortoise in the M400. I was so excited about this. I thought I missed the boat on getting one. At the same time, I was reaching out to Goldspot Pens to inquire about a number of pens. Tom there told me their shipment of M400 brown tortoises was just arriving and he could set one aside for me. I tried to get a BB oblique but that nib was not available for this pen. I decided to go with EF since I knew that the M400 is not a large pen. So, with excitement, I had an EF brown tortoise in in transit. The shipment sent out before the end of September. I thought it would arrive by October 1 so I planned my October line-up with it in mind and set aside Pilot Iroshizuku Ina-ho for it. The pen came in a box with a white cardboard sleeve for shipping. Ridding the sleeve yields a large heavy cardboard box with satiny looking cover and a faux-wood base. Pulling off the cover reveals a white faux leather pen pouch with a faux wax seal elastic. Open up the pen sleeve and one will find the M400. There’s a lot of faux in the packaging but it’s well-done, tasteful and feels good in hand. But then, it's just packaging and will end up in my closet after this review is done. The M400 is not a large pen. In my November line-up it is the 2nd shortest pen, being longer than the Franklin-Christoph Pocket 20 and just a touch shorter than the vintage Parker Vacumatic Major Golden Pearl. In terms of girth, it is the most slender pen in my November line-up, but very similar to the Pocket 20 and the Vac. 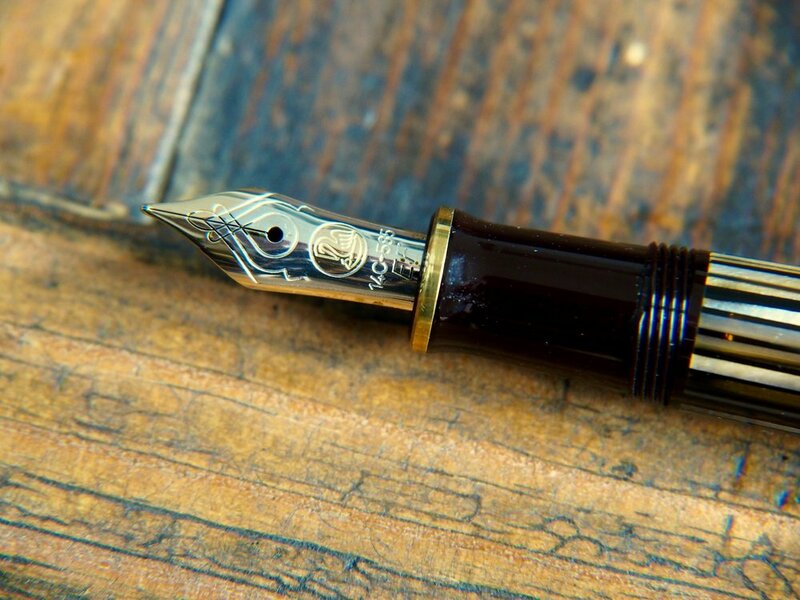 To me, the Pelikan M400 has a vintage pen vibe because of it's looks and size. The cap is made of dark brown, almost black, resin. The finial features the modern Pelikan stepped design. The springy gold plated clip is in the famous stylized Pelikan “duck bill”. The top is frosted and and the Pelikan logo is laser etched. At the base of the cap is a narrow gold band followed by a wider gold band. The wider band is etched with the words “PELIKAN SOUVERÄN GERMANY” . The cap comes off with 3/4 turns which is one of the fewest amongst all the twist cap pens I have. The threads in the cap are 1/3 of the way from the lip of the cap so, although it takes less than a full to uncap, it still feels secure. The M400 is a piston-filler. The turn-knob and the group section are both made of the same dark brown resin as the cap. The section tapers gently towards the nib of the pen and flares out at the end to prevent finger slips. At the bottom of the grip is a simple gold band. At the top of the grip are 4 threads that meet the barrel. The threads are smooth and not obtrusive. The grip is short though. I think most people would have to grip the threads too. I don’t find them uncomfortable but heavy grippers may find them bothersome. The piston knob lies atop the the barrel and is delineated by a pair of matching gold bands. The piston tapers slightly to the end which is domed. The barrel itself is one of the prize #1 with this pen. It is made of cellulose acetate in the beautiful brown tortoiseshell pattern. The material has shiny striations of silver, grey, black, brown and orange. You’ll think with all these colours it would look like a clashing mess but it all works. It’s a masterful interpretation of tortoiseshell. Because the barrio is translucent, it is possible to peer inside to see how much ink is remaining in the right light. This is a small and light pen. It’s certainly smaller and lighter than I expected. The pen is well-proportioned for it’s size. It can be used unposed but I prefer having that little bit of extra weight from the cap. 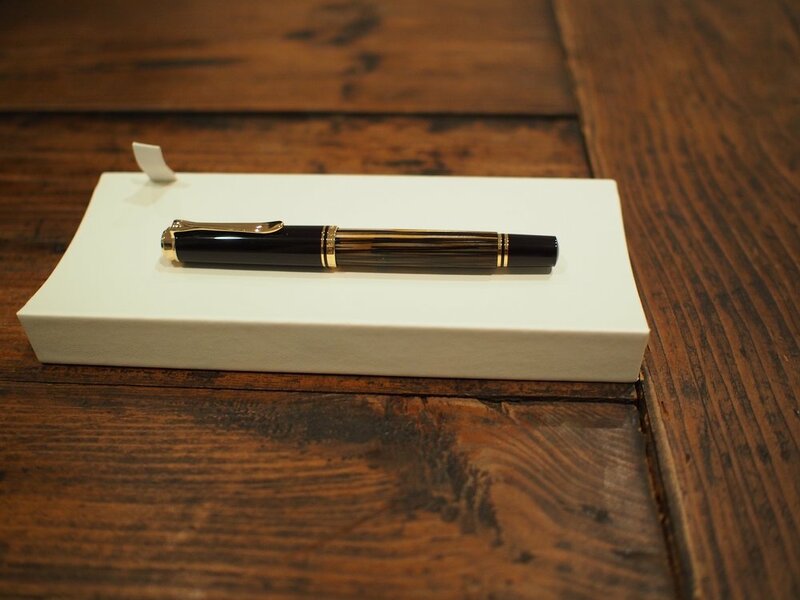 The 14K bicoloured nib is exquisite and prize #2 of this pen. There is some lovely scrollwork around the slit and greater hole. It is a lovely design element without being overly fussy or ornate. Compared to other modern nibs, take Lamy Lx, for example, it looks busy. The middle of the nib features the Pelikan logo. Below that, engravings its the words “14C 585” and one line below, the nib size “EF”. I’ve read stores about Pelikan nibs being inconsistent and I was worried about that. However, the nib on my pen wrote perfectly out of the box. So, I have nothing but positives to say about the nib. Ink flow is juicy and perfect. The nib is soft which takes away bumps and feedback from paper. My nib preferences tend to be at extremes. Either EF at the narrow end or stubs, italic and music nibs at the other. I was interested in trying Pelikan’s famous BB oblique italic nib but, as I mentioned, it’s not available oaths pen. I went with EF knowing it would write wide compared to a Japanese fine. Indeed, it is quite wide for my preferences. I’ve learned to adapt my pen usage for difference purposes. So, with this wide EF nib, I enjoy doing lettering work like my quotes/matra of the day or journaling. The width does mean the the shading of Ina-ho shows off nicely. My first Pelikan pen has lived up to my expectations. I’ll have to use it longer and with different inks to see how it performs under difference conditions over a longer period of time. For now, the classically designed pen with beautiful brown tortoiseshell gets a big thumbs-up from me. I do wish the overall pen dimensions were larger. I get that Pelikan makes larger pens. I would like to try the M600 or M800 which I think would be more along the pen sizes I prefer. I knew that the M400 is a smaller pen but since none of the other larger pens in production are tortoiseshell, I have limited choice. This pen makes the perfectly sized purse pen though. It also slips easily into the pen loop of my Traveler’s Notebooks. So the small size could be an advantage in certain use cases. Thanks to Tom at Goldspot Pens for providing this pen to me at a discount for the purpose of review. Goldspot Pens has a wide selection of pens so you can check them out for your own pen habit. To be honest, it took me a while to settle on this pen due to their large selection, but I’m thrilled to have it.